This page introduces official social media accounts (Twitter, Facebook, and Instagram) operated by the Goryokaku Tower. Please use the social media accounts upon agreement to the community guidelines. The latest information about the Goryokaku Tower, event information, and seasonal pictures are shared. 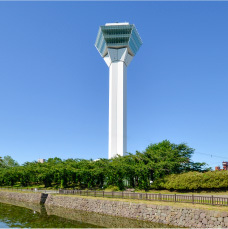 From new products, popular products to recommended products, our staff at the Shop Sales Division of the Goryokaku Tower delivers as much useful information as possible. We hope you use it as a reference when shopping souvenirs for family and friends, as well as keepsakes for your trip. Gota-kun shares what is happening at the Goryokaku Tower, event information, and sightseeing information. *Please note that Gota-kun’s posts use many playful languages to facilitate communication unique to social media. Please note that we do not follow all the users who follow our accounts. In addition, even if users do not follow our accounts, we may follow users.